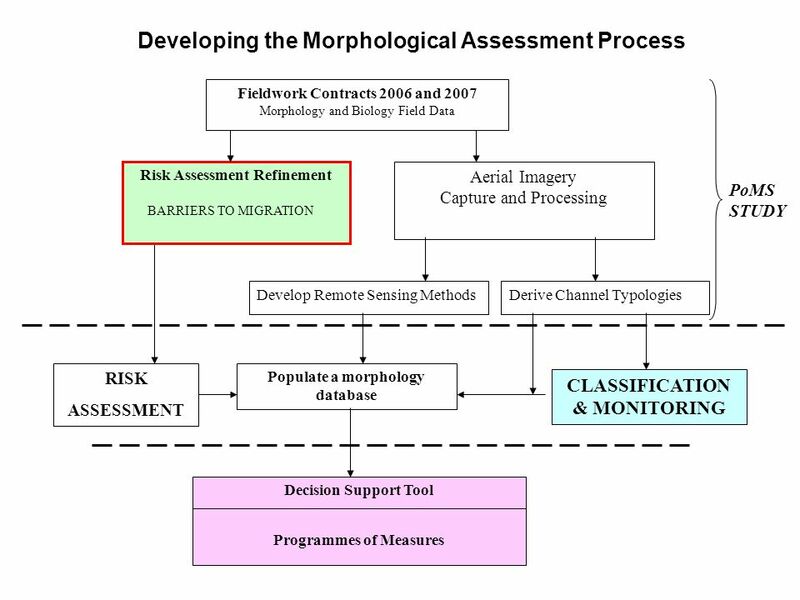 Risk Assessment Refinement BARRIERS TO MIGRATION Aerial Imagery Capture and Processing Derive Channel TypologiesDevelop Remote Sensing Methods Fieldwork. 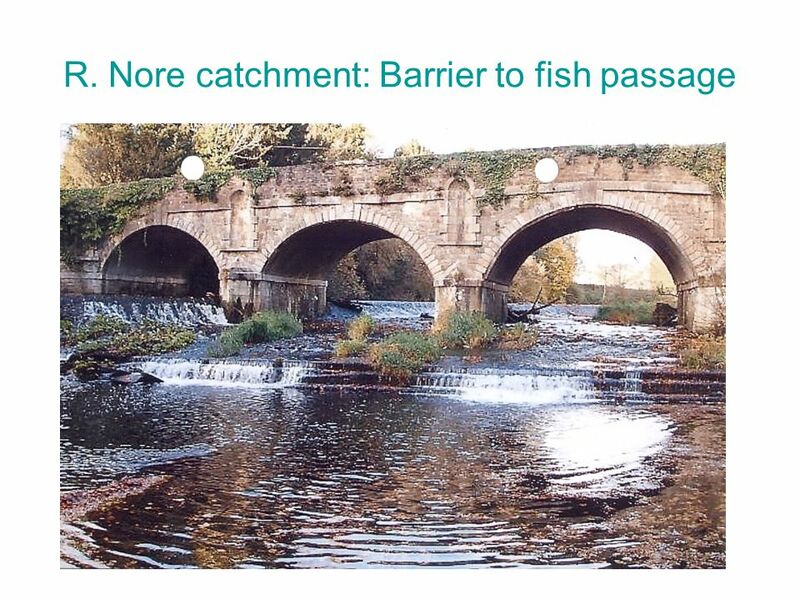 2 Assessment of Barriers in the Nore Catchment The study will use an approach for the assessment of the impact of in-river barriers to fish migration, on a case study basis in the River Nore (Southern Regional Fisheries Board area), which can be used subsequently to assess river barrier impacts nationally. 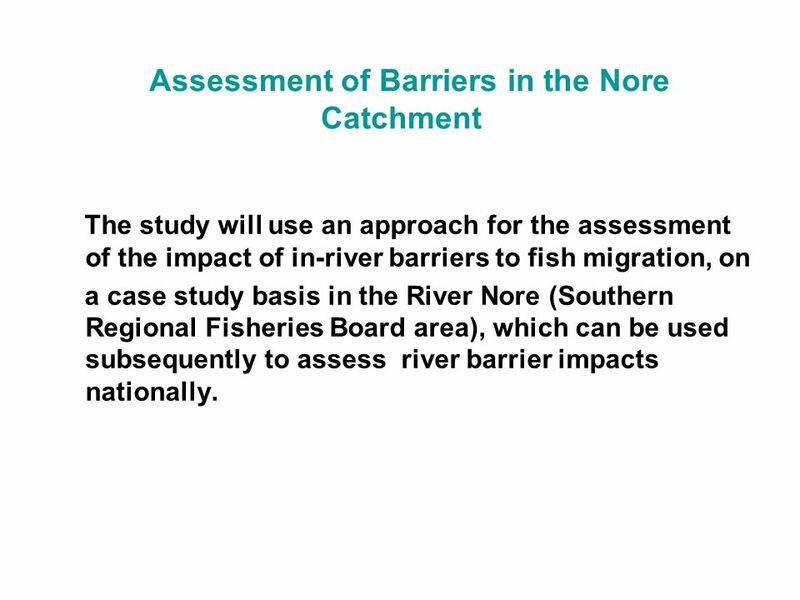 3 Methodology The Southern Regional Fisheries Board has compiled an extensive data set on the distribution of artificial and man-made barrier throughout the Nore system. 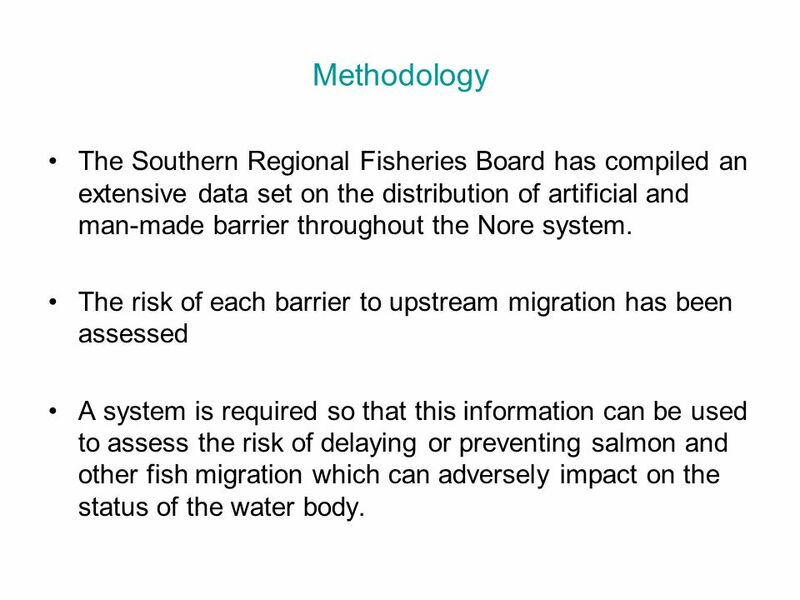 The risk of each barrier to upstream migration has been assessed A system is required so that this information can be used to assess the risk of delaying or preventing salmon and other fish migration which can adversely impact on the status of the water body. 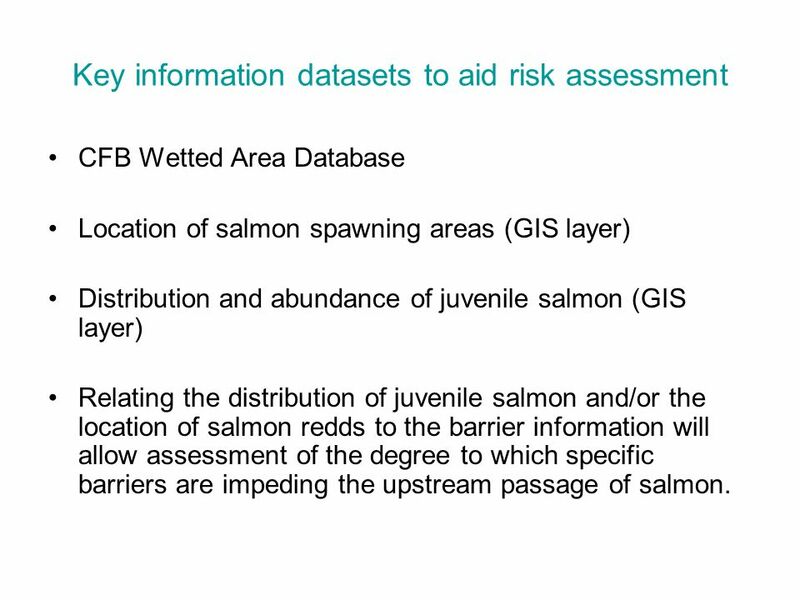 5 Key information datasets to aid risk assessment CFB Wetted Area Database Location of salmon spawning areas (GIS layer) Distribution and abundance of juvenile salmon (GIS layer) Relating the distribution of juvenile salmon and/or the location of salmon redds to the barrier information will allow assessment of the degree to which specific barriers are impeding the upstream passage of salmon. 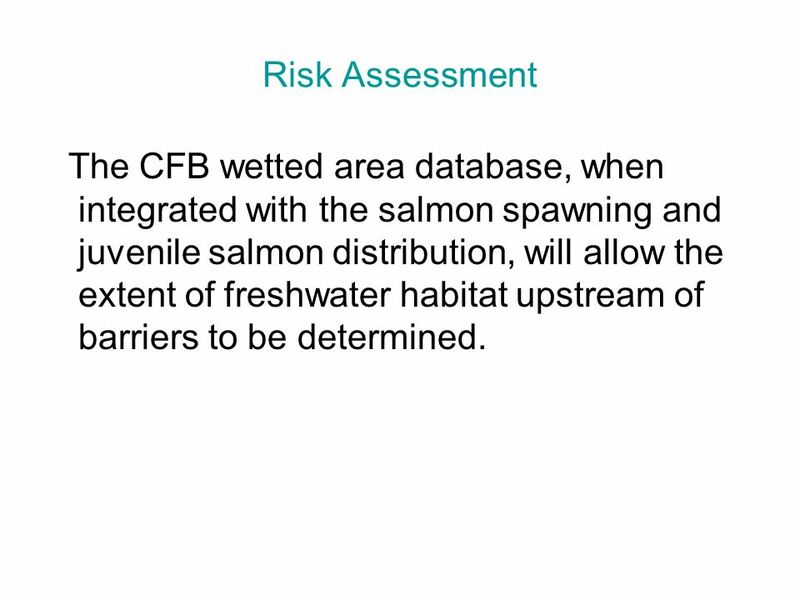 11 Risk Assessment The CFB wetted area database, when integrated with the salmon spawning and juvenile salmon distribution, will allow the extent of freshwater habitat upstream of barriers to be determined. 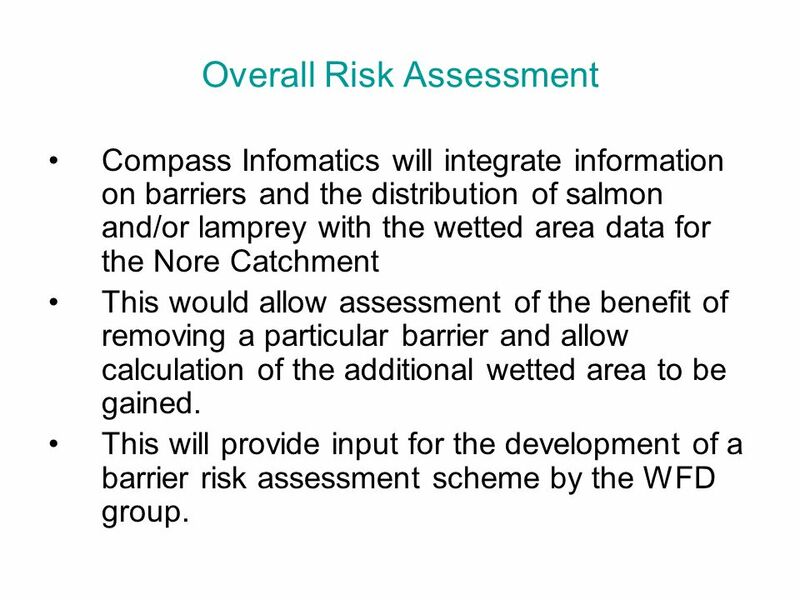 12 Overall Risk Assessment Compass Infomatics will integrate information on barriers and the distribution of salmon and/or lamprey with the wetted area data for the Nore Catchment This would allow assessment of the benefit of removing a particular barrier and allow calculation of the additional wetted area to be gained. This will provide input for the development of a barrier risk assessment scheme by the WFD group. 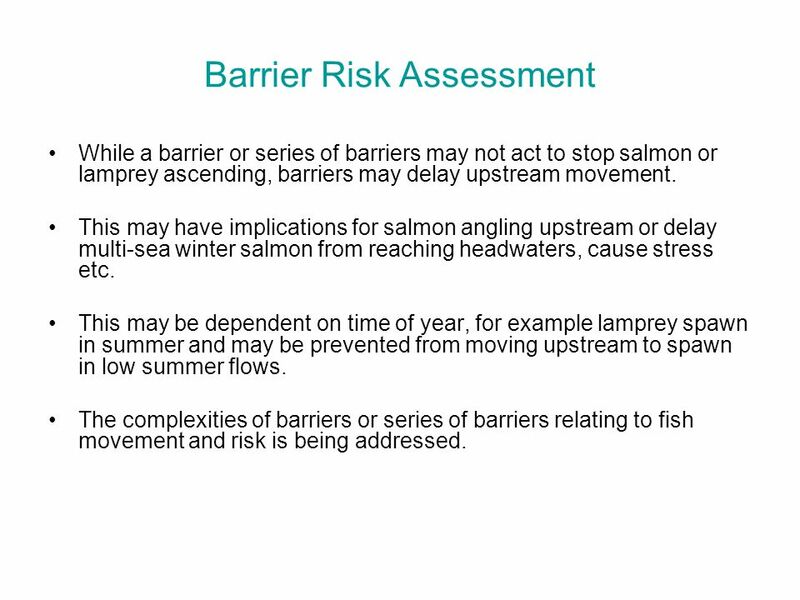 13 Barrier Risk Assessment While a barrier or series of barriers may not act to stop salmon or lamprey ascending, barriers may delay upstream movement. 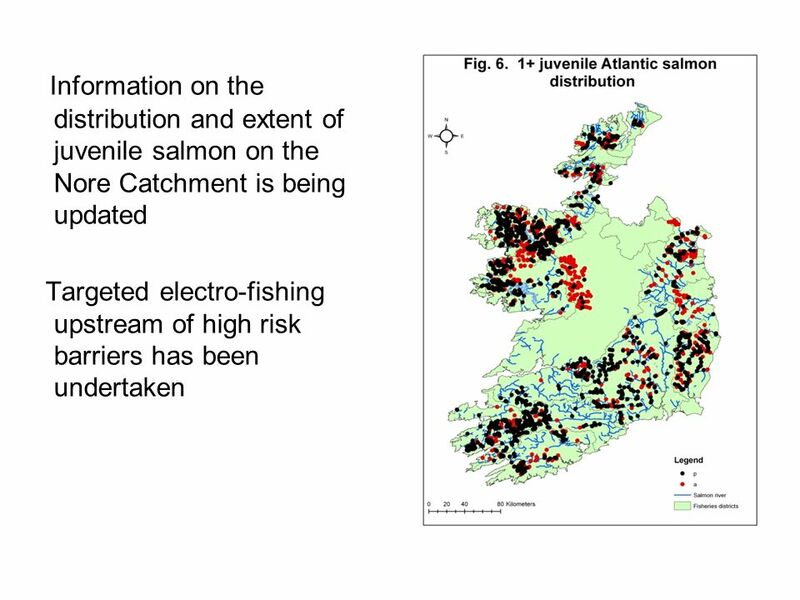 This may have implications for salmon angling upstream or delay multi-sea winter salmon from reaching headwaters, cause stress etc. 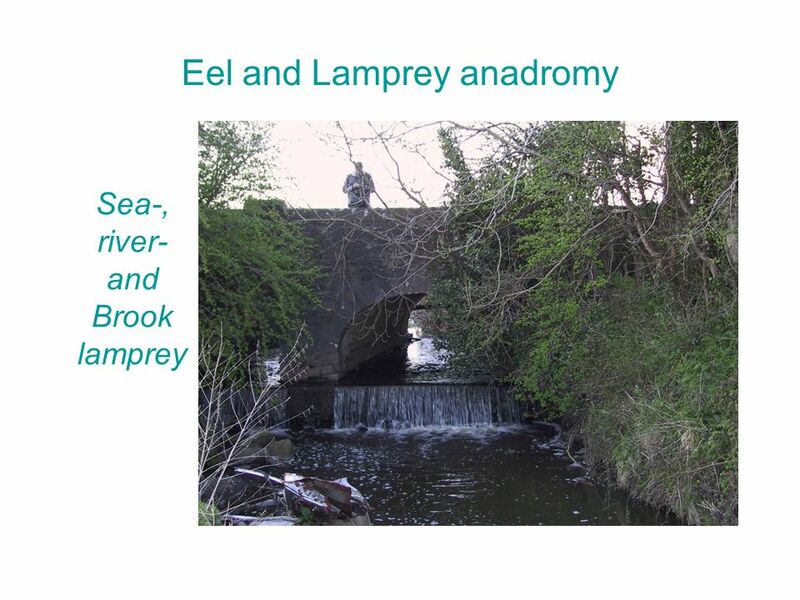 This may be dependent on time of year, for example lamprey spawn in summer and may be prevented from moving upstream to spawn in low summer flows. 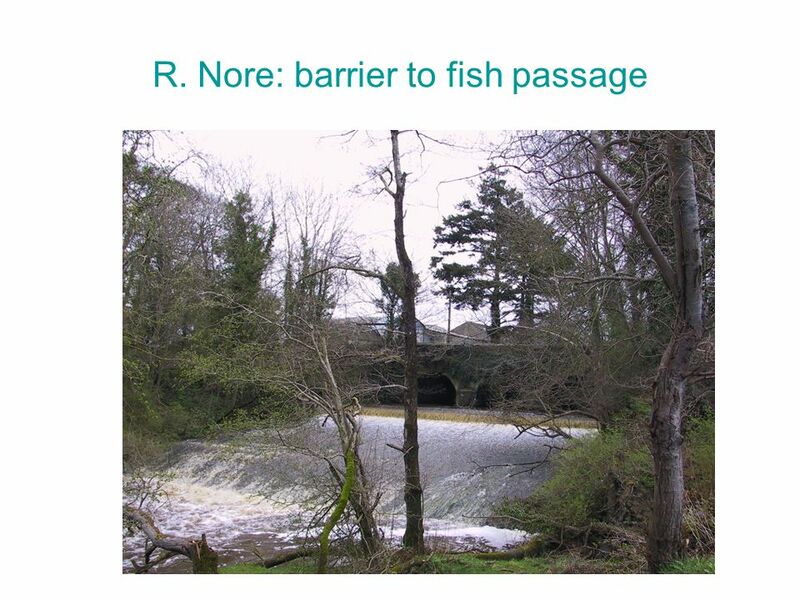 The complexities of barriers or series of barriers relating to fish movement and risk is being addressed. Download ppt "Risk Assessment Refinement BARRIERS TO MIGRATION Aerial Imagery Capture and Processing Derive Channel TypologiesDevelop Remote Sensing Methods Fieldwork." Colville Confederated Tribes and the Okanagan Nation Fisheries Commission. 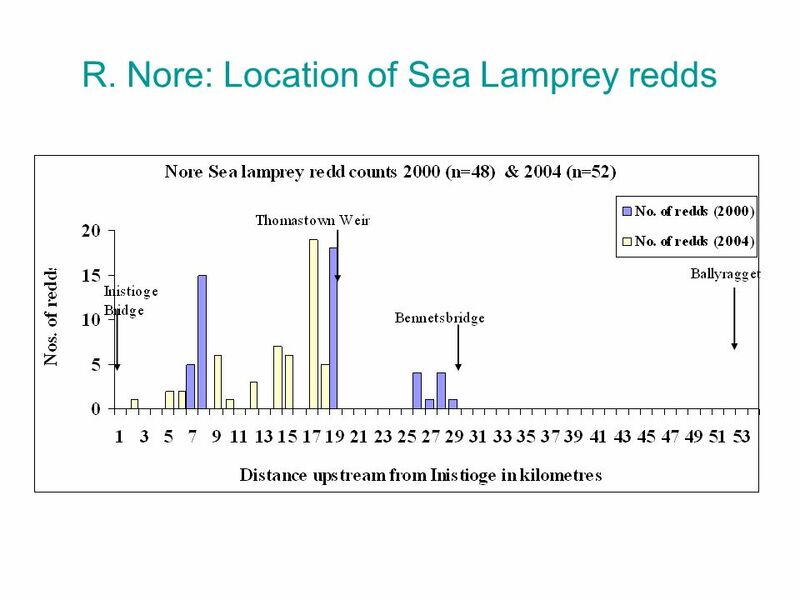 Lake Creek Chinook Salmon Performance Measures Paul Kucera and Chris Beasley Nez Perce Tribe/HDR FishPro. Evaluate Spawning of Fall Chinook and Chum Salmon Just Below the Four Lowermost Columbia River Mainstem Dams Project PNNL. Assessing effects of Columbia River Basin anadromous fish flow management on the aquatic ecology of the Henrys Fork watershed A Proposal By The Henrys. Protect and Restore Little Salmon River Project # Nez Perce Tribe Fisheries/Watershed Program By Chad Fealko. Cyndi Baker & Jen Graham. 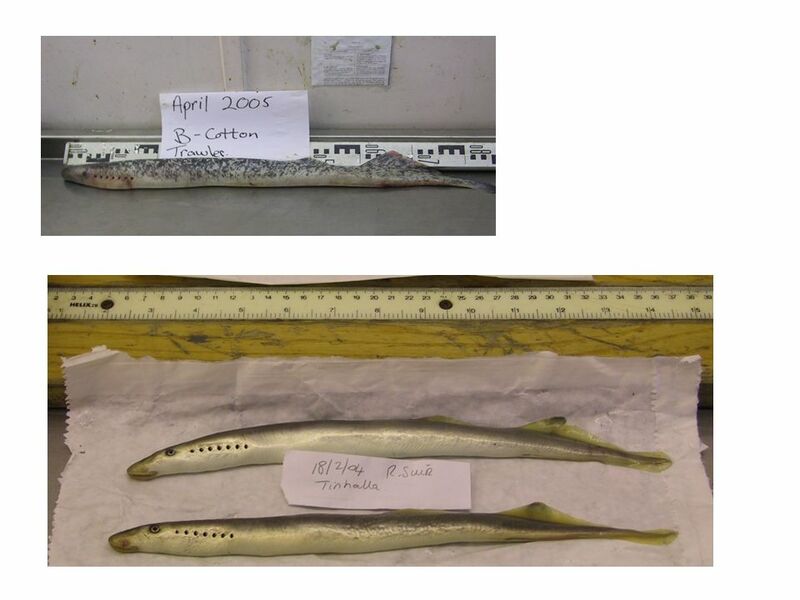 Began in 1998 to document bull trout life history in WSR and SC and monitor population abundance Data from 1998. Robert Weber PA Fish and Boat Commission Fisheries Biologist Fish Management Division. 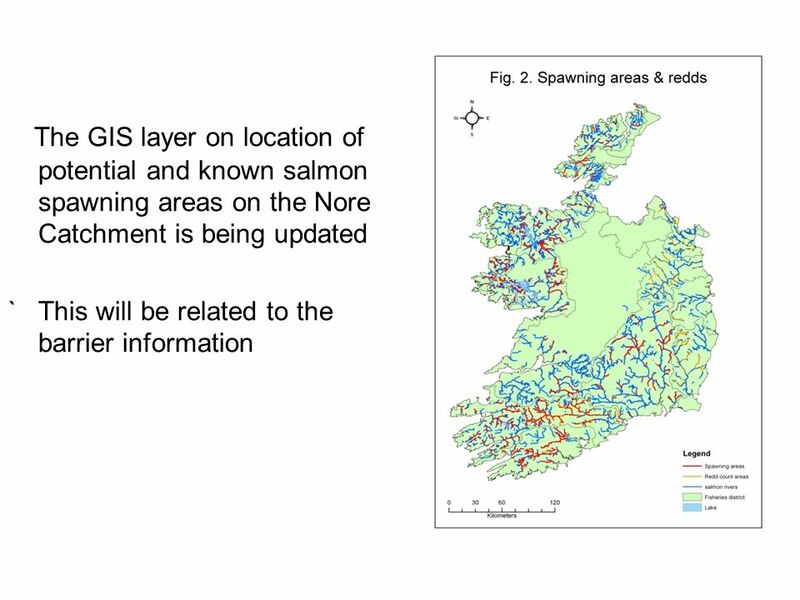 A three way management solution The Don District Salmon Fishery Board The Don District Salmon Fishery Board The River Don Brown Trout. Dinin Water Management Unit Action Plan NameDinin Water Management Unit Area300 km 2 River Basin DistrictSouth Eastern RBD Main CountiesKilkenny Protected. Coho Reintroduction in the Upper Columbia: Using Adaptive Management to Achieve Success Fisheries Resource Management Yakama Nation. Draft River Basin Management Plan Workshop Freshwater Pearl Mussel December 2008. 1 Programmes of Measures and Standards Freshwater Morphology Workshop Pilot Study - Risk Assessment Refinement Lorraine Houston Sheila Downes 4 th April. Background Coastal cutthroat trout (Oncorhynchus clarkii clarkii) (CCT) are one of the ten major cutthroat trout subspecies in North America. They reside.